I’ve been adapting fairly well to the dairy-free life, but there are some things that I just can’t get over. I’ve been craving cheese like crazy lately – cheeseburgers, pizza, cheesy bread. I’ve also been craving candy. Sour candy is good, but it can’t replace chocolate. I love Almond Joy candy bars. I can still remember when Mike got some for our trick-or-treaters and I had to hate-watch him eat the leftovers. Yes, I’m still upset about that over 4 months later. Thankfully, Nicole from Cookies on Friday could fix at least one of my cravings. 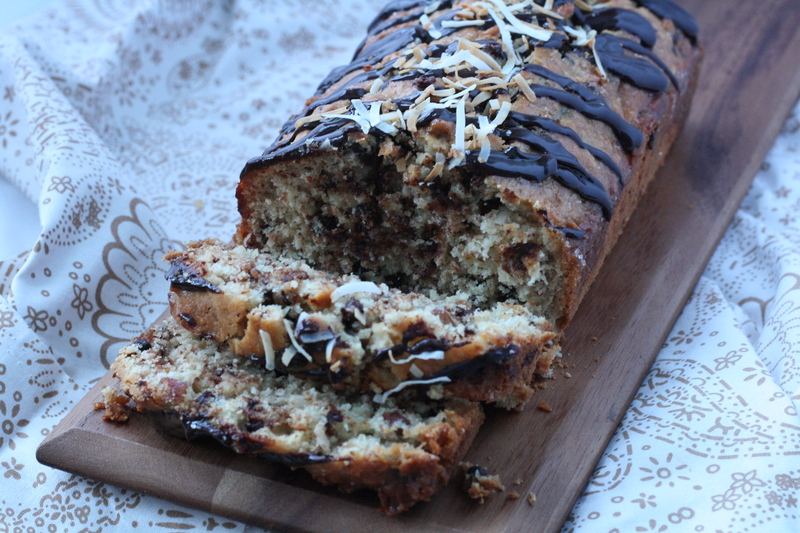 I was able to easily adapt her Almond Joy Bread recipe to be dairy-free. This bread was so good that I almost didn’t want to share. But, I did share because I’m a kind and loving wife. I even left over half the leftovers with him in Appleton. (Actually, I kind of regret doing that now). This bread is definitely on my make-again-asap list and it should be on your must-make-immediately list. Just sayin’. Preheat oven to 350. Lightly grease a 4.5″x8.5″x2.5″ loaf pan and set aside. Combine lemon juice and soy milk in a small bowl. Let sit for 10 minutes. In a large mixing bowl, beat together eggs, sugar, stevia, coconut oil, vanilla and coconut extract until smooth and creamy, about 2 minutes. In a separate bowl, whisk together flour, baking soda, baking powder, and salt. Mix 1/3 of the dry ingredients into the wet ingredients. Mix in 1/2 of the soy milk. Mix in 1/3 of the dry ingredients. Mix in remaining 1/2 of the wet ingredients, followed by the last of the dry ingredients. Mix until just combined. Fold in coconut, almonds, and chocolate chips. Pour batter into the prepared on, smoothing out the top. Bake for 50-55 minutes, or until top is golden brown and a toothpick inserted into the center comes out clean. Let cool for 10 minutes in the pan. While bread is cooling, make the glaze. In a small pot, whisk together sugar, water, coconut oil and coconut extract. Using a toothpick or skewer, poke holes into the top of the bread. Move bread onto a cooling rack and place a plate underneath. Brush or spoon the glaze on top, letting the glaze soak in. While cake sets, make the ganache: Place chocolate chips into a small bowl. Heat soy milk to a simmer over medium-high heat. Remove from heat and pour over chocolate chips. Whisk until smooth. Drizzle over bread. 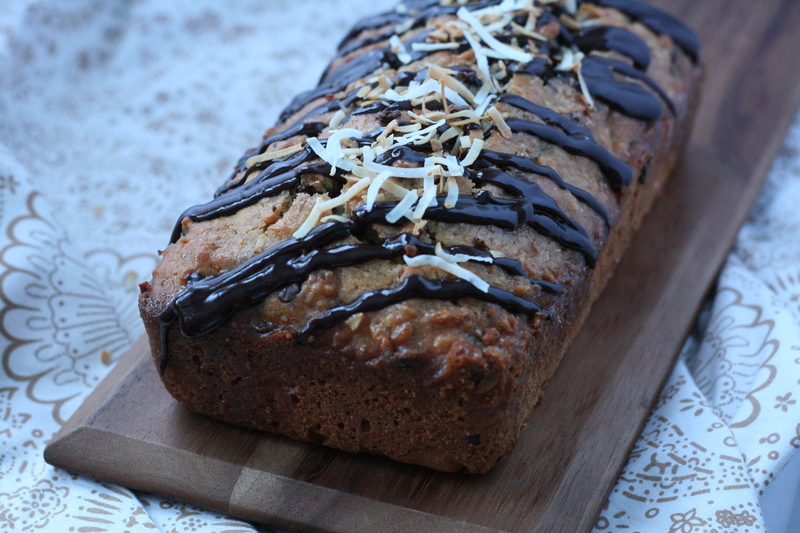 Top with additional toasted coconut, if desired. A big thanks to Sarah at Taste of Home Cooking for hosting! Click on the link below to check out the other delicious swap recipes! Categories: Bread, Muffins & Rolls, Breakfast & Brunch, Chocolate, Dairy Free, Dessert, Special Diets | Tags: bread, breakfast, dairy free, dessert | Permalink. OOoh this looks good. I’m a newbie to dairy-free. Developed sudden allergy that leaves me with an awful rash all over my hands. I miss cheese so much, been sampling vegan cheeses, not too bad, the best i’ve found is called Sheese, it even has a slight melty quality. I will be trying this recipe! Wow, this looks so decadent and amazing. I really wish I had some right now! This is such a fabulous recipe! I’m so glad that you could make it dairy free. I’m wondering if this could be made with splenda vs. sugar. My dad would love this, but he is diabetic, so I have to watch the sugar amount in recipes. I’ve never baked with Splenda myself (I usually use stevia), but I did some digging and it looks like Splenda can be used as a cup-for-cup substitute. One site I found suggested that you use 1 cup of granular Splenda + 1/2 teaspoon of baking soda for every cup of sugar you replace. Also, keep in mind that it probably won’t brown like it should without the sugar, so you will have to keep an eye on it and use a toothpick to check for doneness. I would start checking for doneness about 5 minutes earlier than the recipe states. Oh man, this looks fantastic! !